We are bringing back one of our most popular specials: Hawaiian Pizza! 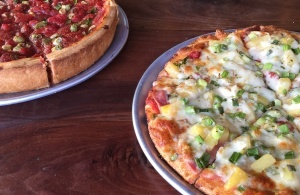 This sweet and spicy pizza is packed with Canadian bacon, pineapple, green onion and pepper jack cheese. This pizza is available stuffed or thin crust in Oakland and Berkeley only. Check it out soon! It will only be around for a couple of weeks! 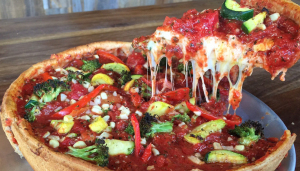 In San Ramon and Pleasant Hill, we are still rockin’ our Super Veggie special. This pizza is a veggie-lover’s dream: zucchini, yellow squash, red bell peppers, broccoli, white corn with yellow cheddar and Monterey Jack cheese. It’s also available stuffed or thin crust.